Judge Richard L. White, 51, Arlington, VA, formerly of Kansas City, died in Woodstock, Va.
Mr. White was a municipal judge in Kansas City from 1965 to 1971. He later was associate director of the traffic court program of the American Bar Association in Chicago. He operated a judicial management consulting firm in Washington before he retired in 1974. He was a lieutenant commander of the U. S. Naval Reserve before he retired and a Navy veteran of the Korean War. He received his bachelor's and judicial doctorate degrees from the University of Kansas City. He was born in Kansas City and lived in the area most of his life before he moved to Washington in 1971. 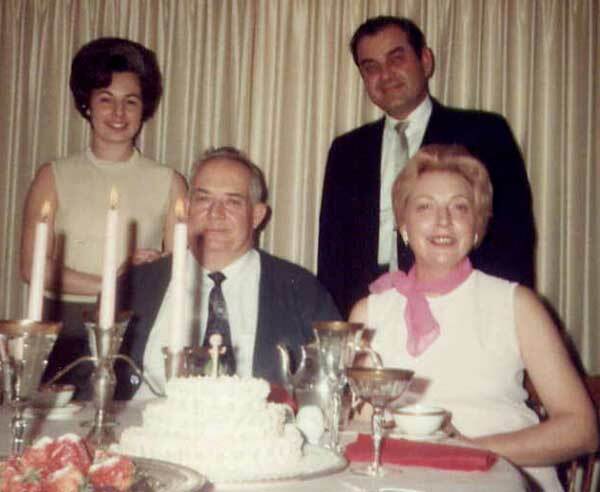 Cherie and Judge Richard White standing behind Fred and Pauline Stone. Cherie & Alan Meyerhoff were very close friends of Pauline H. Stone. Alan, before he married Cherie; and Cherie, in her previous marriage to Richard White, when their oldest son was about 5. Mother and Cherie were close for over 30 years. When Mother, Pauline, was 80 she related a story to me that took place when she was 72. She was living in Daytona, FL at the time and had driven to New Orleans to meet Cherie who was attending a conference. The two of them were bar hoping on Bourbon Street. Mother had gone to use the facilities in one of the bars and found all of the waitresses standing in a circle, passing a cigarette around. They asked her if she would like a hit. She shrugged and said, "Why not". She told me that she had never danced so much and had such a good time as that night. In the summer of '66, I was attending Kansas City Junior College in an attempt to make up my grade point average to get back into The University of Missouri at Columbia where my grades had suffered the first semester of college due to parties and lack of study. It was during this attempt that I received my draft papers from the Army. My Dad told me not to open them and to apply at the Navy. When I went to apply for the Navy, they told me they could put me on a 90 day waiting list for boot camp. I didn't have 90 days. My Dad then contacted his friend, Judge Richard L. White. Apparently, the Navy owed the judge a favor. A 17 year old was bumped to the end of the line and I left for boot camp in two weeks. One will never know, but this favor may well have saved my life.